This is the time of year for all kinds of wonderful roasted vegetables. Cooler weather brings in the best that Brussels Sprouts have to offer. Brussels Sprouts look like baby cabbages (and they kind of taste like them) not because they are baby cabbages, but because they’re part of the same family. With cabbages, we eat the head that grows out of the ground and with Brussels Sprouts we eat the buds that grow along the length of the thick stalk. 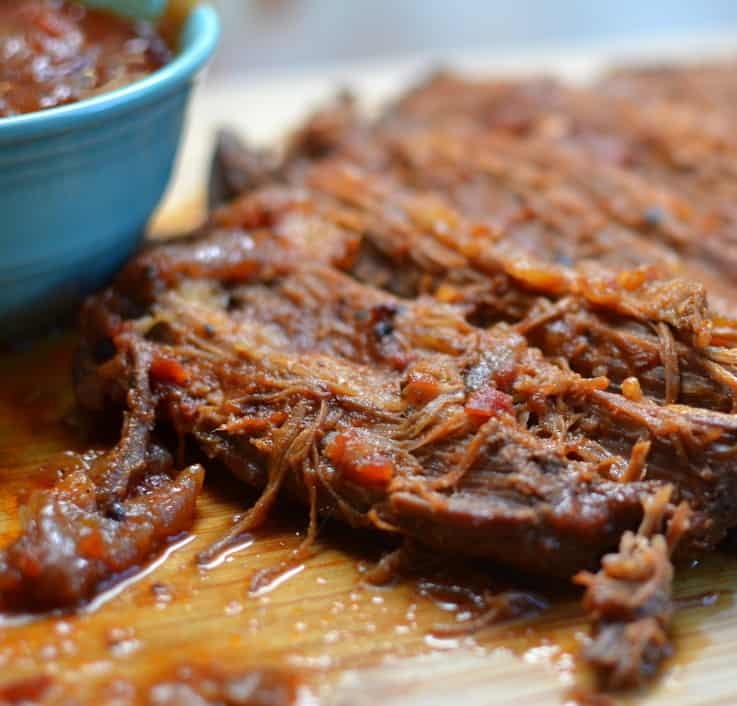 These little treasures can be quite tasty when prepared properly. These Crispy Parmesan Potatoes and Brussels Sprouts are the cats meow. Have you tried any of my other roasted vegetables? Green Bean Bacon Bundles, Honey Chive Butter Oven Roasted Corn and Parmesan Crumb Asparagus are just a few family favorites. 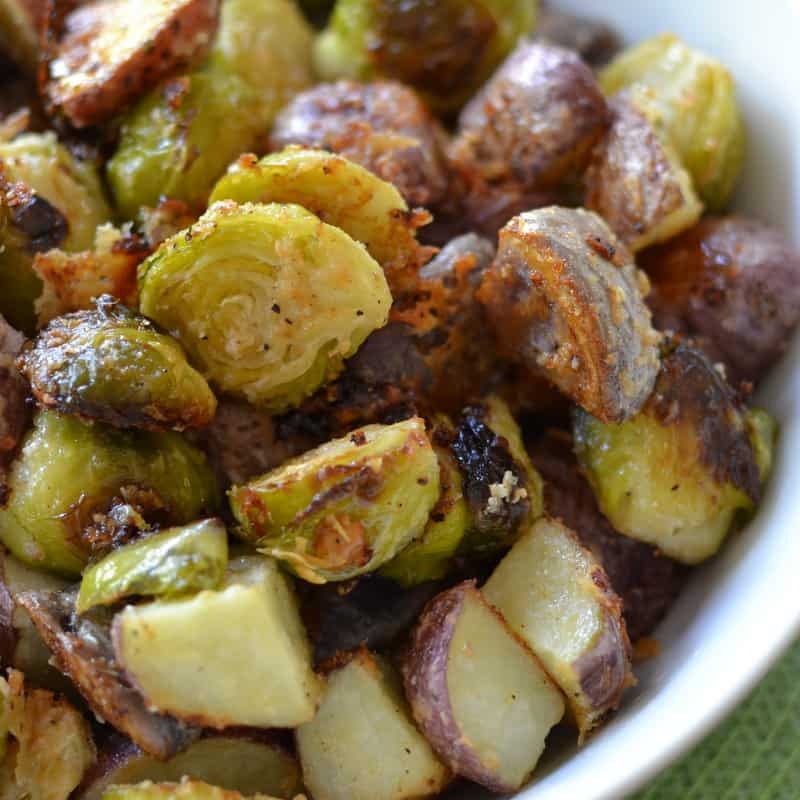 This fabulous lightly seasoned Crispy Parmesan Potatoes and Brussels Sprouts combines both red and purple potatoes with Brussels sprouts and Parmesan. The result is flavorful oven roasted vegetables with a crisp Parmesan crunch. Have you ever tried purple potatoes? “The rule of thumb with fruits and vegetables is that the deeper and richer the color, the more nutritious the content tends to be.” You can read all about purple potatoes at Daily Health Post Surprising Health Benefits of Purple Potatoes. 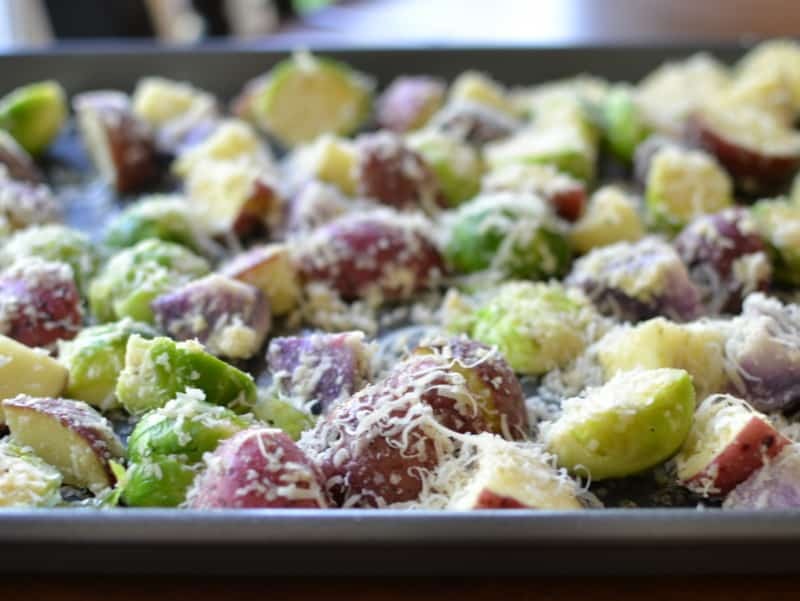 This Crispy Parmesan Potatoes and Brussels Sprouts is quick to come together and clean up is an absolute breeze since you mix it all in a large Ziploc bag. I spray the cookie sheet with some olive oil so the Parmesan cheese will stick to the veggies and not to the cookie sheet. The leftovers are great reheated in a skillet and my hubby loves them with eggs over easy served over the top of them. I have also added the leftovers to browned Kielbasa sausage and onions! Oh my! I have managed to make myself hungry yet again. Dang it! Preheat oven to 400 degrees. Grease a baking sheet with non-stick spray or olive oil and set aside. 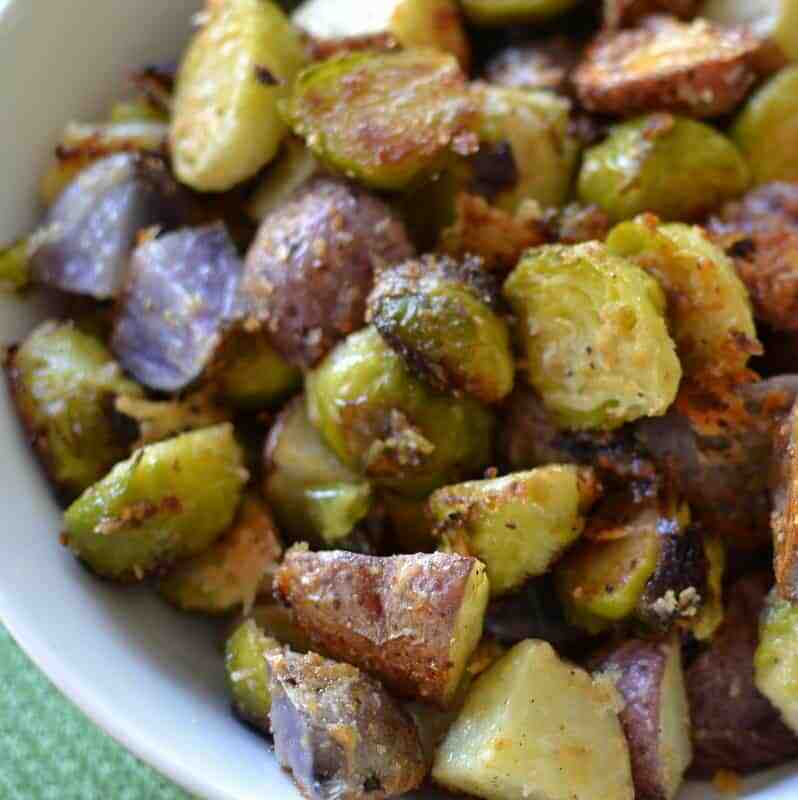 Combine Brussels Sprouts, red potatoes, purple potatoes and olive oil in a large Ziploc bag and shake to coat. Add the Parmesan cheese, onion powder, garlic powder, salt and pepper to the bag and shake to coat. 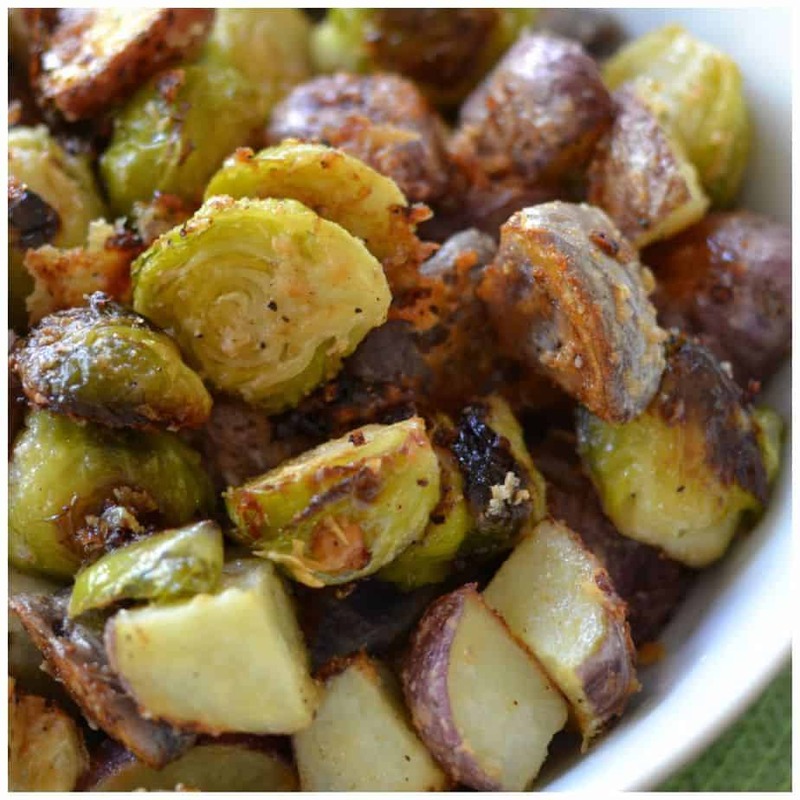 Spread in an even layer on the baking sheet and bake for 20 minutes; turning on the broiler the last 1-2 minutes of cooking to lightly brown the Brussels Sprouts and potatoes. Serve immediately. If you can not find purple potatoes you can substitue gold or more red. 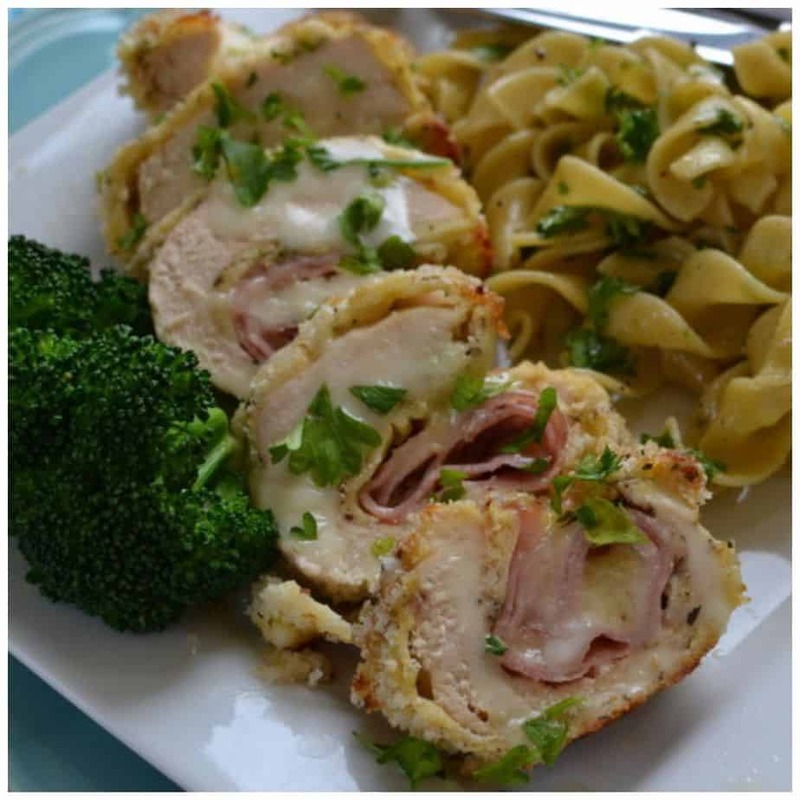 More recipes you will love!! I had to cook them an additional 10 minutes in order for the potatoes to be cooked through (I had quartered them). Watch broiling as the leaves of the Brussels sprouts can burn quickly. Thanks for the heads up Clare! Good tips! !